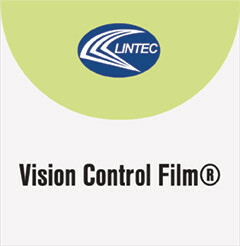 VisionControlFilm® by Lintec is one of the most innovative and exciting films available for glass. The effect it creates is quite simply amazing. From one viewing angle VisionControlFilm® is optically clear - as if there’s no film on the glass at all. But as you change your viewing angle the glass magically changes its opacity until a frosted effect is achieved. Compatible with UV curable printers. An economical solution to adding a graphic to VisionControlFilm® is to print on Lintec's E-2203RC and install over the VisionControlFilm®. This allows you to change out graphics without having to remove the VisionControlFilm® from the glass surface.